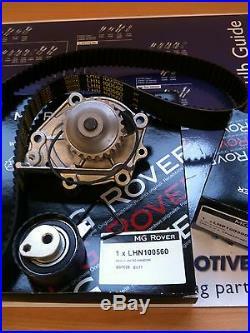 We are E-Carparts Ltd of Sandy Bedfordshire - Independent Suppliers of MG ROVER parts. At trade prices delivered to your door. This item is available for immediate despatch, this is Brand New and boxed MG Rover timing belt, water pump and tensioner which is the original part, suitable for the following vehicles. LANDROVER FREELANDER 1.8 16v 07/97-10/06. MG EXPRESS 1.4 16v 03/03-05/05. MG EXPRESS 1.8 16v 03/03-05/05. MG F 1.6 16v 09/00-02/02. MG F 1.8 16v 04/95-02/02. MG TF 1.6 115 16v 05/02-10/05. MG TF 1.8 120 16v 02/02-10/05. MG ZR 1.4 105 16v 08/01-10/05. MG ZR 1.8 120 16v 08/01-09/03. MG ZS 1.6 16v 11/01-10/05. MG ZS 1.8 120 16v 08/01-10/05. MG ZT 1.8 160 16v 08/01-10/05. MG ZT-T 1.8 160 16v 12/01-10/05. ROVER 25 1.1 16v 09/99-05/04. ROVER 25 1.4 16v 07/99-05/04. ROVER 25 1.6 16v 07/99-05/04. ROVER 25 1.8 16v 07/99-05/04. ROVER 45 1.4 16v 01/00-05/04. ROVER 45 1.6 16v 01/00-05/04. ROVER 45 1.8 16v 01/00-05/04. ROVER 75 1.8 16v 04/99-04/05. ROVER 75 1.8 TURBO 16v 11/02-04/05. ROVER 75 TOURER 1.8 16v 04/01-04/05. ROVER 75 TOURER 1.8 TURBO 16v 11/02-04/05. ROVER CDV 1.4 16v 03/03-04/05. ROVER STREETWISE 1.4 16v 06/03-05/05. ROVER STREETWISE 1.6 16v 10/04-05/05. The KIT consists of: Timing belt, water pump & Auto Tensioner. Add a map to your own listings. The item "GENUINE MG ROVER K SERIES TIMING BELT KIT 25 45 75 MGF TF WITH WATER PUMP" is in sale since Friday, March 02, 2012. This item is in the category "Vehicle Parts & Accessories\Car Parts\Other Car Parts". The seller is "ecp2004" and is located in Sandy. This item can be shipped worldwide.